OMG. 4 words. Raw Oatmeal Cream Pies. You need to make these! So delicious! Over the summer, I made a recipe for oatmeal cream pies. It was delicious, but I have been wanting to do a raw version ever since. So today was the day. I am so glad I did since I totally loved everything about these raw oatmeal cream pies! If you like copycat recipes, you may also like my Reese’s Peanut Butter Eggs and my Homemade Mounds Bars. These raw oatmeal cream pies are vegan and gluten free. All you need is 6 ingredients! Super east recipe. My 5 year old helped me make them. In fact she made a snowman out of the leftover dough as I was cutting the shaped out lol. Kids are funny. 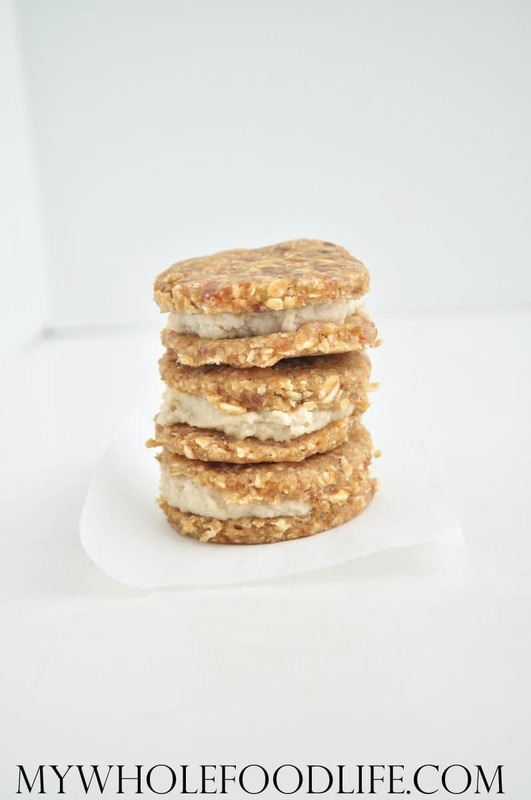 All you need is 6 simple ingredients to make these raw oatmeal cream pies! Drain and rinse the cashews and place them in a food processor with the maple syrup and lemon juice. Blend until smooth Set aside in the fridge as you make the cookies. In the food processor , combine the dates and oats. Add the coconut oil and gather the dough in a ball. Wrap and place in the fridge for a minute. Place a piece of parchment paper on your counter top. Put the dough on top of the parchment paper and flatten it with your hand. Place a sheet to plastic wrap, or another piece of parchment on top of the dough. Using a rolling pin , roll out the dough. Using a circular cookie cutter (I like this one ), cut cookie shapes and place them on a lined baking sheet or plate. Once all the cookies have been cut, spread the filling on top and make sandwiches. I got 12 cookie sandwiches out of my batch. Place back in the fridge to firm up if the dough has gone a bit soft. Keep these stored in the fridge. They should last at least a week or two. Enjoy! Can't wait to make these! I love, love, love Little Debbie oatmeal cream pies but they are so bad for you. Awesome recipe! Thank you!! I used to love those myself! These sound delicious! I only used are and stevia as sweeteners. Do you think you could substitute dates for the maple syrup? That should say "use dates and stevia". Made these this morning. We liked them. Some observations: I have a 12 cup food processor. There is not enough filling ingredients to successfully blend. I had to switch to a smaller bowl insert. Also the cookie dough doesn't ball up while processing. I had to squeeze it together with my hands. It rolled out easily. I got 12 cookies exactly. It is a very sweet treat. Thanks for the recipe! I hope these comments help. Well... I've never had a 'real' oatmeal cream pie but these look amazing!!!! Any idea what the nutrition facts are on these? I had to use old fashion oats vs the gluten free. It's what I had in the pantry. These turned out AWESOME though! So glad you liked them!! I don't know the nutrition facts offhand, but I believe you can upload the recipe to My Fitness Pal for a rough estimate. My kids (who are used to and enjoy healthy treats) were not fans of these at all. I doubled the batch so now more for me to enjoy! The texture is what's throwing the kids, I think. It tastes like an uncooked cookie. I'm sorry you didn't care for them. Maybe doubling the batch effected the texture? No, I don't think doubling affected the texture at all. They looked exactly like the ones in your picture. They held together quite well. Pingback: Raw havermout oreo’s | Wat eet je dan wel? I've always love non-baked recipes. I don't have maple syrup on hand, can I replace it with organic raw honey? I'm worried if it won't bind. Oh no. :( I am not sure what happened. I hope they still taste good! Hi Melissa. Do you think if I halved the recipe it would come out the same tasting? I'm the only one that will be eating them in my house and didn't want to make such a big batch. Thank you! I would like to make these for a treat now. Do I have to soak the cashews overnight? You can do a quick boil for about 25 minutes to soften them too. I just added a little water to the mixture and it turned out great! Thank you! My kids devoured the entire plate! Thank you for another great recipe!!! You are so welcome Michelle!! So what about the filling? What size cookie cutter did you use to get 12 out of it? I used a small round cookie cutter. Is the coconut oil melted?